The .300 WSM — Next Big Thing in F-Open Competition? Earlier this month, Forum Member Steven Blair won the California Long-Range Championship (F-Open Class) shooting a .300 WSM. Here Steve explains the advantages of the .300 WSM cartridge in long-range competition. Steve also discusses the learning process required to shoot the stout-recoiling .300 WSM successfully. Steve cautions: “It took me months to learn how to shoot my .300 WSM rifle well”. There has been much interest lately regarding .300 WSM (Winchester Short Magnum) in F-Open competition. The cartridge is already well-established in 1000-yard benchrest and has been used successfully in F-Open, notably by Derek Rodgers to win the 2010 National Championship. Derek used, as do most .300 WSM BR shooters, a 210-grain bullet. The .300 WSM is a modern design, short and fat with a 35° shoulder. It is a slightly rebated and beltless magnum, capable of approaching .300 Winchester Magnum performance with notably less powder. It has an excellent accuracy reputation and I’ve found it very easy to tune. Berger introduced the outstanding .30-caliber, 230-grain Hybrid bullet in 2011. This bullet ballistically eclipses all others, caliber .30 and under. Berger rates it as G7 .380 and G1 .743. Trimmed and pointed, the B.C., estimated from elevation adjustments at 300, 600, and 1000 yards, increases to G7 .410. It is also an exceptionally accurate bullet. The combination of these two items, .300 WSM cases and Berger 230gr Hybrid bullets, and their application to long range F-Class, is what I will discuss in this article. VOICE FILE: Click Button to hear Steven Blair Explain How to Master the .300 WSM. .300 WSM Brass — Choices are largely limited to Norma, Winchester and Remington (Lapua, are you listening?). Since I have only used Winchester and Norma brass, I won’t discuss Remington brass, which may also be a viable choice. I found Norma brass to be exceptionally good and have seen no evidence of short life that I’ve heard elsewhere. Winchester brass can produce results equal to Norma, if first sorted, culled, and prepped. There is a significant price difference between the two brands. It is worth noting that Norma manufactures both .270 WSM and .300 WSM brass. Either can be used. Winchester makes .270 WSM, 7mm WSM, .300 WSM, and .325 WSM brass. Again, any can be used but 7mm WSM requires pushing the shoulder back. The other three have the same shoulder dimension. Bullet Selection — My approach is to use the highest B.C. bullet available that is accurate. As mentioned above, the hands-down, .30-caliber winner is Berger’s 230gr Hybrid. My loads using 230gr Hybrids produce approximately 2865 fps from 34″ barrels. In order to equal the 1000-yard, 10 mph wind deflection, 215 Hybrids must be run at 3030 fps, a fairly stiff load. By contrast, 7mm 180gr Hybrids must start at 3100 fps, not reliably achievable in most conditions. Lapua now makes a 220gr Scenar-L that Erik Cortina has shot a fair bit and reports that it is very accurate. It has a similar profile to the Sierra 220gr MatchKing, another possible candidate, albeit with much lower B.C. than Berger’s mighty 230gr Hybrid. Barrel Life — After 1126 and 936 rounds shot at F-Class cadence in two barrels, my best guess is at least 2000 rounds accurate barrel life. The barrels look better than any of my .284 Shehane barrels at this point. Steve’s .300 WSM rifle features a BAT 3-lug action (with integral recoil lug and +20 MOA rail), in a Manners F-Class stock. The barrel is a 34″, 1.25″-straight contour Krieger or Brux fitted with an Erik Cortina 1.25″-diameter tuner (shown at right — note Index Marks). Other hardware includes a Bix ‘n Andy trigger, and Nightforce 12-42x56mm NXS scope (NP-R1 reticle). Some of these components were chosen to aid tracking (given the additional recoil). The rifle weighs 21 pounds, 13.5 ounces — just under the 22-pound F-Open limit. Accuracy and Tuning Ease — The .300 WSM tunes more easily and is more tolerant than any of the four 6mmBR barrels I’ve shot. It is the most accurate large-caliber cartridge I know. A number of 1000-yard benchrest records were set with the cartridge and my experience reinforces that. During my .300 WSM load development, several 100-yard, five-shot groups were in the “ones”, no mean feat for a rifle pushing 230 grains at nearly 3000 fps. The load tolerance window, the powder charge spread where velocity, ES and accuracy are relatively constant, is 0.8 grains in my loading. That means the same load can be fired confidently in many conditions. Exterior Ballistics — The extent to which the big bullet reduces wind deflection and vertical movement must be experienced to appreciate. I shoot against 7mm cartridges ranging from .284 Win to 7mm WSM, no slouches among them. When they are blown into the 9 Ring, I stay in the 10 Ring. When range vertical pushes them up or down to lose a point, I see it, too, but don’t drop points. However, there is nothing magic about it. The shooter still must point the gun at the right place. The mistakes just cost less and, since F-Class is an Aggregate game, the point spread will accumulate. Recoil — This is the big downside of the .300 WSM + 230gr Hybrid combination. My rifle weighs 2½ ounces shy of 22 pounds and still pushes me around. My early testing was done with a load that produced 2950 fps. I still cannot shoot it well. The load is very accurate but I cannot manage the recoil consistently. At 2865 fps, it is manageable but always requires careful attention to body position, shoulder pressure, front rest setup, rear bag characteristics and other ergonomic factors. I have learned that shooting a rig with this much recoil places more emphasis on the factors our sling brothers and sisters have managed for many years. It took me months to learn how to shoot the rifle well. I fired over 1000 rounds before I began to feel comfortable. Persist, the results are worth it. Summary — If you are willing to put the effort into learning how to shoot the cartridge and have a reasonable recoil tolerance, the investment will pay dividends. My scores have increased and become more consistent. My confidence in the rifle has also increased, no small matter in a game with many mental aspects. Be prepared for what could be a long learning curve. If all that sounds like too much, one of the 7mm cartridges is pretty close and certainly competitive in the right hands. My choice, given all the factors listed above, is .300 WSM. Left to Right: RCBS Chargemaster, Hoover meplat trimmer, Omega trickler, Sartorius GD-503 scale. Steven Blair has competed in F-Class competition since December of 2010 and F-Open since November of 2011. He placed fifth in the F-Class National Championship this year and is the two-time winner of both the California Long Range F-Class Championship and Twentynine Palms Long Range Regional. Steve shoots on Team Lapua. Share the post "The .300 WSM — Next Big Thing in F-Open Competition?" The latest CDNN Investments Catalog has been released. As usual there are some great deals on name-brand factory rifles. CDNN typically purchases overstocked inventory at deep discounts off normal wholesale and passes the savings on to CDNN’s customers. To see all the latest deals you’ll need to download the current CDNN 2009-2 Catalog, a 100-page .pdf (Adobe Acrobat) file. Among the many bargains, below we list three that caught our attention. In addition to firearms, CDNN’s catalog also features magazines, gun cases, optics, and many other accessories. 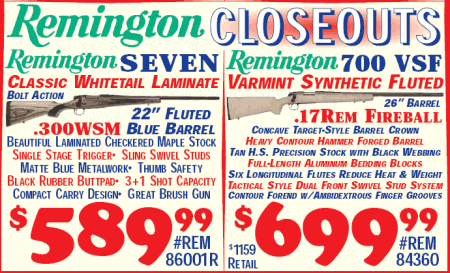 Share the post "Rifle and Barreled Action Bargains at CDNN"